We could provide a long list of the things children will learn when they take up martial arts. However by focusing in on each element in turn we can appreciate them a whole lot more. And we’ve just introduced the first one in a very appropriate way… focus. If you want to learn martial arts you have to focus on what is being taught. Furthermore you have to be aware of specific moves and how to focus on perfecting them. You’ll focus energy as well as your thoughts, and the more you do this the more habitual and familiar it becomes. Parents; Increase You Childs Confidence In Weeks! Claim Your Free Week Trial Now! It’s no big surprise then to learn that kids who get better at focusing their energies and thoughts in martial arts classes suddenly find that focus is put to good use elsewhere as well. Oftentimes kids who have some experience in martial arts may start to do better at school too. If they previously had trouble concentrating in lessons, that issue might just disappear in time. It’s easy to focus on how the physical skills and techniques learned in martial arts enable you to perform a series of moves whenever taught or required. However by focusing on learning these physical elements of martial arts, the kids will learn to improve their mental focus as well. The two go together very well, even though you don’t necessarily think of the mental improvements first of all. 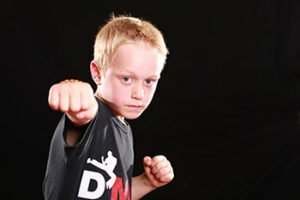 The good news is most kids who did have issues with focusing at school and elsewhere (on homework, perhaps) very often don’t realise they are improving as a result of their martial arts training. They improve naturally without any real effort. It’s all thanks to the focus and effort they put into the martial arts classes and the ripple effect that has on their lives.